Cookie Hack. 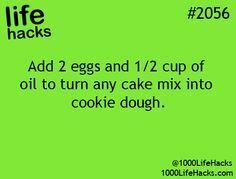 Add 2 eggs and 1/2 cup of oil to turn any cake mix into cookie dough. 1 box makes 24 cookies.